Please click here to register for class and purchase your class card! Gift Certificates are available here. Williamstown, MA- Studio Address: 20 Spring St. Parking: Street parking Monday-Saturday 9am-6pm is limited to one hour. Outside these times there is not a time limit. Public parking is available 1) In the lot at the bottom of Spring St. 2) Behind the Field House off Latham St. 3) In the Water St./Rt. 43 parking lot. North Bennington, VT Address: The Left Bank, 5 Bank St. Parking is available in the lot behind the building. Iyengar Yoga: Noted for its clear alignment and playful exploration, as well as for plumbing the depths of experience Iyengar Yoga was founded by yoga pioneer B.K.S. Iyengar. Yoga Basics Over 50: Emphasis on Level I poses and foundational alignment. All ages are welcome, but the orientation of the class is to support beginning students optimize health and well being across the life span. Alignment Yoga 1: Accessible entry poses in all categories are given with careful instructions, including surya namaskar (sun salutation), standing asana, arm balancings, inversions, seated forward bends, hip openers and twists, and restoratives. Alignment Yoga 2/3: More challenging poses are introduced in all the categories of poses. Students can kick up into handstand at the wall and push up into wheel pose. Level I/II Vinyasa Flow: This mixed level class moves at a steady pace with intelligent options, variations and modifications for all levels to explore. This practice synchronizes breath and the continuous flow of movement to build strength, endurance, balance and self-awareness. Expect creative sequencing and mindful alignment cues as you deepen your practice. Discover new and interesting ways to advance your practice. T’ai Chi: Qi gong exercises followed by instruction in the Yang style Cheng Man-ch’ing short form, the most widely practiced form of T’ai Chi. The slow, flowing movements of the ancient Chinese art of T’ai Chi offer a remarkably effective workout for people of all ages. Williams College Students, Faculty and Staff 10% Discount on Ten Class Card. 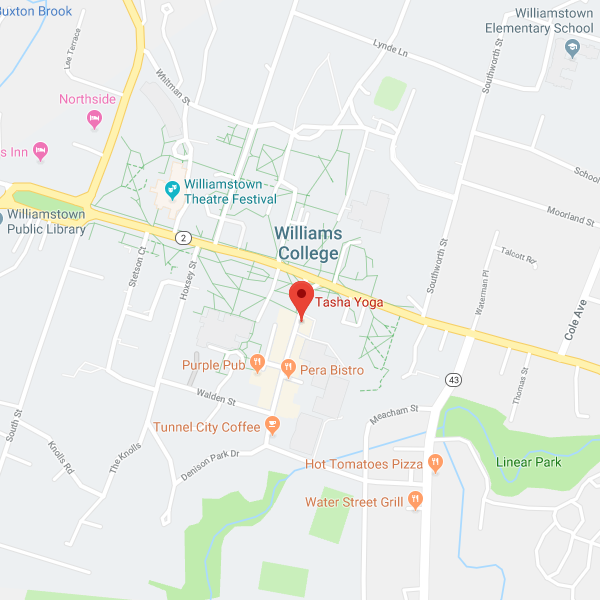 A $150 rebate for classes taken at Tasha Yoga is available to BCBS members through the Williams College Wellness program. Download the Blue Cross/Blue Shield Fitness Benefit Form.